I'd love for you to meet Joseph Mary. I would love for you to know the face, the voice, the personality, the hair color of this child. I would love for you to know the jokes, the soft skin, the smile, and even the tears and whines of this little one. I would love more than anything to be able to introduce you to my child. But I can't. At least not yet. Joseph Mary died within me. I was ten weeks along when the blood began. We were at a museum at a special exhibit marking the life of Saint John Paul II. The world stood still for several hours as my heart twisted and wrenched in agony. The rest of my body followed a few hours later. I saw my baby's picture on the screen and the technician didn't need to say a word. I could see right away that there was no heartbeat in my precious baby's tiny chest. We went home and a few hours later, labor began. It was like a mini birth - contractions ebbing and flowing and escalating in intensity until finally I passed my tiny baby's body onto a square of toilet paper in my bathroom. A few minutes later the placenta was out. I was empty. We grieved. We mourned. I cried a lot, for weeks, in fact. We buried Joseph Mary's body in our parish cemetery and our beautiful priest presided at our baby's funeral Mass and accompanied us to the gravesite. The ultrasound showed that Joseph Mary died at about eight weeks gestation but the miscarriage didn't begin until a few weeks later (which is completely normal). In pregnancy land, weeks of gestation are counted at the beginning of a woman's menstrual cycle and not when the baby was actually conceived. It is assumed (often erroneously) that the baby is conceived two weeks to the day after. This means that if a woman tells you she is 18 weeks pregnant, her baby is actually only 16 weeks old. This means that Joseph Mary was only six weeks old when that little heart beat for the last time. I saw my baby. I knew what to look for and I saw the characteristic curve of the embryo. I could identify my baby's tiny head and spine and the beginning of eyes and arms. I could not tell if we had a son or a daughter and that is one of the biggest aches of my heart. We had a feeling that he was a boy but I so very much look forward to meeting our child in heaven and knowing if we were right. I am forever grateful for the grace of being able to hold my baby's body and give this little one a burial. I remember begging God for that gift after learning that our baby was dead. "Please, Lord, please just let me see him." So many parents don't get that gift. Often there is so much blood or the baby comes out before a mother even realizes she is miscarrying and the small body is washed away. And many many women grieve that chance to see and hold their babies just that one time. It was an immeasurable gift to me to have that. I wish more women knew that even while miscarrying, it is NOT weird or crazy to keep all the remains of the miscarriage to bury, even if you can't identify the body and that doing so can be an incredibly healing process for the mother and father and a loving last gift to your child. I wish every woman knew that in many Catholic dioceses in the United States there is a reserved space in a Catholic cemetery for unborn and stillborn children, often low cost or even free of charge and can be used by anyone. In Catholic theology, burying the dead is one of the seven corporal works of mercy. It is the reason that most Catholic hospitals have a communal burial in a cemetery of all the tiny babies that are miscarried rather than just allowing their remains to be thrown away. I am so grateful I was able to labor and pass my baby at home without complication or pressure, without strangers checking in and probing and questioning me during some of the saddest moments of my life. I wish more women knew that they have that right. If it's safe in their situation, there is no rush to pass the baby and the entire process can take several weeks. Afterwards, a doctor or midwife can check to make sure the miscarriage was complete so that there aren't any complications. You have the choice to intervene if you want but if there are no complications, you don't have to just "get it over with" because the provider wants you to. 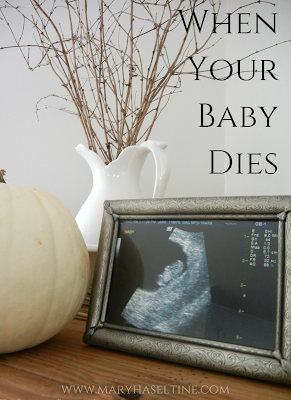 The reason I write all of this is that October 15 is Pregnancy and Infant Loss Remembrance Day. In October of 1988, President Reagan declared October National Pregnancy and Infant Loss Awareness month. Probably not coincidentally it is also "Respect Life" month within the Catholic Church. Families throughout the world will be lighting candles at 7 p.m. in memory of the babies lost before, during, or shortly after birth. These babies deserve to be recognized and remembered. These babies are REAL. Joseph Mary is REAL. Those who have had an unborn child die are grieving a real death. They are not just grieving an idea or a dream (so insulting). They are grieving a very real person who lived and who died. I've heard people say some pretty obtuse things regarding the personhood of the unborn but I think the attitude that most makes me want to bang my head against a wall is the idea that a baby is a baby only if others recognize that he or she is so. He was not a human being and worthy of living simply because we believed he was. That is ridiculous and insulting and just plain dumb. Throughout history entire groups of people have tried to dehumanize others in order to justify their own repulsive actions. Whether it was Jews or homosexuals or people of color or the disabled, it has been done before and is being done today with the unborn. "Less than a person," they say. But a person's essence and dignity does not rest upon the belief of others. Ever. If someone you know suffers a miscarriage or a stillbirth, please recognize it. Treat them like their child just died, because their child just did. I know sometimes grief is uncomfortable and we don't know what to say or do but if we think that unborn babies are real people then we need to act like their death is a real death. We don't have to do everything and we can't fix it. But we can send a card. Cook them dinner. Send flowers. Have a Mass said for the baby. Give them a Christmas ornament to hang on their tree in memory of that baby. Say the child's name. Remember the anniversary. Give them a plant to plant in memory of that baby. Listen to them. Call them to see how they are doing. Let them cry. Above all, don't just pretend it didn't happen. When in doubt, just say "I'm so sorry." For all those other mothers and fathers who are grieving the loss of a baby, you are not alone. I want to tell you that I am so very very sorry. Your baby is real and your grief is real. I want to tell you that my heart breaks for you and that your baby matters. There is no grief allotment based on the age of your baby. And while you will always remember that baby, that raw and wrenching grief will be softened over time and with faith. It may be hard to believe right now but the God of life can make beautiful things even out of this horrific tragedy you have endured. I know. For me it was a Michael, a David, a Luke, a Benedict, and a Peter. None of them would be here without that loss of their older sibling. He can make all things, even the most heart wrenching things, somehow new, but you will be changed forever by that baby. I want you to know that you can name your baby. If you have one, ask for a picture of the ultrasound (and don't let them tell you no). Ours is the most precious picture we own. I want you to know that you can have (and the Church encourages!) a funeral Mass for your baby. You can receive the Blessing of Parents after a Miscarriage. 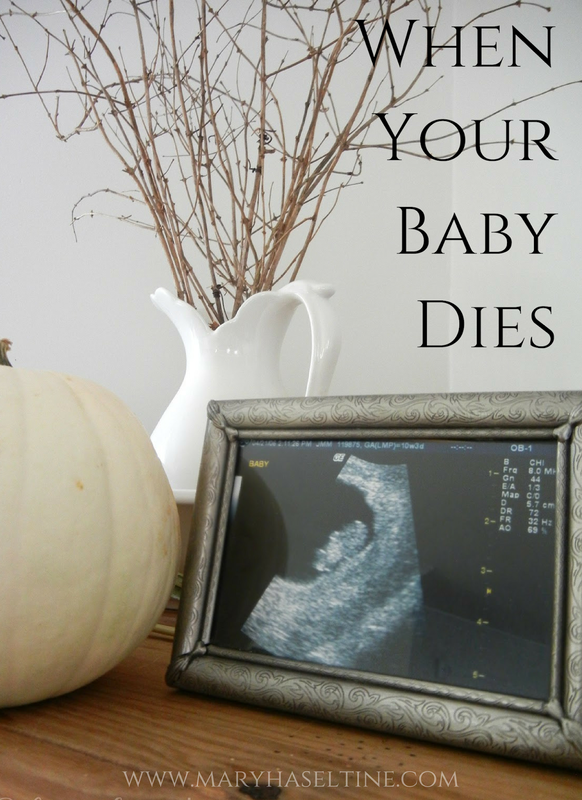 If you have the remains you can give your baby a burial. I want you to know that your son or daughter can be your own personal patron saint and that they don't become an angel. I want you to know that your child can now pray for you. If you have other children tell them about the sibling they don't know. It's good for them. I want you to know that fathers grieve, too, and often it's very different than the way that mothers do. I want you to know that many people will not get it and might say dumb things (but you probably already know that). Try to give them grace but it's okay to give yourself space. And lastly, I want you to know that I would absolutely love to meet your son or daughter some day and I hope you will introduce me. And then, more than anything in the world, I would love for you to meet my precious Joseph Mary. So, so, SO beautiful, Mary. This really made me cry. I am so sorry about your sweet little Joseph Mary. I have a friend that I am going to forward this to. Thank you. this is beautiful, Mary! i was thinking the same thing, i have two wonderful friends who have lost babies.....what a Cross, silent suffering....i have a brother who is with your Joseph Mary....know that i am praying for you and look forward to all of us being reunited one day in Heaven. Oh Mary so beautiful! We will join u on remembering all those babies who have died and now reside with our Lord in heaven. I can't wait to meet our first child someday and all my nieces/nephews who join our little one. As we rejoice with the birth of our newest little one, we will never forget those we never got to meet but hope to someday in heaven. Beautiful Mary, God bless you and Joseph Mary. You have me in tears. So beautiful! I'm sorry for your loss, and I'm sure it was incredibly difficult, but thank you for sharing. Thank you so much for sharing. The words of one who has lost a child helps others know how to respond when another woman loses a child. I only wish I had known before. We will light a candle tonight next to our picture of Joseph Mary. Mary, I can barely write this because of the tears your beautiful, inspirational words have caused. You have such a gift for expressing the deepest emotions of the heart and I know that your words will touch many profoundly. I will light a candle tonight for my 5 siblings and 3 grandchildren who are in Heaven waiting for me to hold & rock someday. Thank you for sharing your soul & heart. Love you! I cant barely type because Im crying so much! I love you Mary! You are such an inspiration for me. I cant wait until the day when I can meet my nieces and nephews that are up in heaven! It will be such a joyous and happy day! We have a candle lit for each of them and an extra one for all the other families that are going through this. I love you! This is so very beautiful Mary. I am so sorry for your loss and I'm so grateful for your words. It's great to have direction in that area... God Bless you and your beautiful family. ALL of you! What an inspiring and lovely post. I have always felt guilt when someone has a miscarriage and I have 5 healthy children...why them? why not me? This was so touching to read and answered some of my questions that I would never want to ask. Thank you. You know, the more I read your blog the more I realize how much we have in common. I too, carried the cross of early miscarriage for 6 years. I have 5 children in heaven spaced between my oldest and middle child. Looking back, I realize how much growing up I had to do and how much I grew because of the cross that Our Lord allowed me to carry with Him. Your post would have been such a consolation for me during that time and I'm beginning to ponder if maybe I should use my blog as platform to share with other women my experience to reach out to others like us how maybe had to suffer in silence. Thank you for reaching out to me and others like me with your heartfelt words. P.S.- I had home births, I homeschool, and I hope to one day homestead...in case you are wondering about our similarities. ;-). Of course, I've been meaning to correspond with you about home birthing as I've been told I can no longer have one. You miscarriage sounds much like mine - 10 weeks, baby passed a few weeks earlier, passed the baby on your own. I didn't have an ultrasound until after the baby passed though, so all I saw was an empty womb. We already had our ultrasound scheduled for "dating" because the size of my uterus was measuring small at my first appointment earlier that week (which was a heads up for me that something was wrong because I use NFP and even though I wasn't charting very closely the month we got pregnant, I would have been shocked if I was two weeks off like my uterus was measuring). When we went in for the ultrasound, the ultrasound tech was so excited for us and told us where "daddy can sit to see the baby" because she thought we were just there for dating. It hurt so much to tell her that we were just there to check if "anything" was left. It really hurts to stare at your empty womb on the screen. I'm so sorry for your loss. How long did it take before the pain wasn't so sharp and you stopped crying all the time? Mandi, I'm so sorry you're going through this. I remember crying a lot. Much more in the first few weeks but it was probably a good few months before every little thing didn't remind me. I remember probably three weeks later just calling my sister who had also gone through a miscarriage and not even being able to get any words out and just crying. It was so good for her to just be there on the other end of the line even though she didn't say anything. We were blessed with conceiving Michael about two months later so that did help a bit, if only if some of my energy grieving was now spent worrying. But it did take a long time for the rawness to wear off and I didn't feel at peace until we were able to finally get the gravestone in which took far too long. It does get "better." I will never ever forget Joseph Mary but that bleeding raw heart feeling does leave over time. At least for me. I read over this post the other day and it did make me cry but not the gut-wrenching sobs from when it was all still new. I can even say now that I'm grateful that his death taught me how to love others better, to appreciate the gift of my children that much more, and I am so grateful that God took something ugly and brought three beautiful lives out of it that would never have been here otherwise. Praying for you. I'm so sorry for your loss. I also lost 2 babies. This tab on your blog inspires me to do something similar on mine. I would like to write something similar. I'm so sorry, Kim. It really really helps to write it out so I'd definitely encourage you to do it! I lost a baby last month at 12 weeks. I still don't know if the baby's body was lost in the public restroom where the miscarriage started, or in the ER when the doctor found "tissue" during an exam and whisked it immediately off to pathology. I was hemorrhaging, otherwise I would have tried to go home. I never got to see the baby, and don't know where the baby's body is. How I wish I had been able to bury the baby's body. I am now left struggling with a way to celebrate or preserve the memory of my child's short life. We named our baby Hannah Paige. I'm so sorry for the loss of Hannah and I hope I get to meet her someday. I'll be praying for you. Hannah Paige, please pray for your mama and family here below.